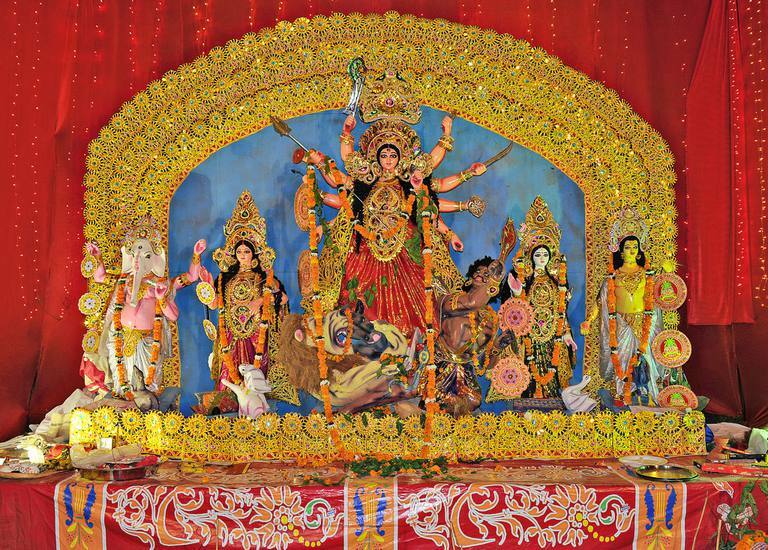 Puja is the ritual worship of a deity through a series of steps. It is part of the Hindu traditional rites or samskaras. Traditionally, Hindus follow the Vedic steps of performing a puja. However, there is also a Tantric method of doing puja which is generally devoted to the cult of Shakti or the Divine Mother Goddess. Puja, or ritualistic worship of Hindu deities, is a very important part of Tantra-Sadhana or Tantric worship. Since external cleanliness is conducive to internal purity, the first thing a worshiper should do before starting puja is to take a bath and wear washed clothes. It may be a good custom to keep two sets of clothes to be worn by turns just for ritual worship. Then clean the puja room and the surrounding area thoroughly. 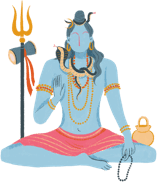 After properly arranging all the vessels and materials needed for the puja, the worshiper should sit on the puja-seat, which should be used only for the purpose of puja, in such a way that he either faces the deity or keeps the deity to his left. Generally, one should face East or North. Facing South is forbidden. The whole rite of puja, or for that matter, any religious or ritualistic act should begin with acamana or ceremonial sipping of water with certain mantras. This is followed by sankalpa or religious resolve. Apart from the details of that particular day according to the Hindu calendar, followed in the tradition of the worshiper’s family, the sankalpa-mantra also contains some other statements such as the destruction of one’s sins, acquisition of religious merit and some other particulars connected with the mode of worship. Then come some purification processes like asanasuddhi or ritual sanctification of the seat; bhutapasarana or driving away the evil spirits; pushpasuddhi or ritual cleansing of flowers, bilva (wood apple leaves), and tulsi (holy basil leaves); and agniprakarachinta or erecting a wall of fire through imagination and so on. The next steps are pranayama or breath-control to calm the nerves, concentrate and bring in peace; and bhutasuddhi or creating a spiritual body in place of the physical one. These steps are followed by pranapratistha or filling the spiritual body with the presence of the deity; nyasas or ritual purification of limbs; and mudras or postures of fingers and hands. Next is dhyana or meditation on the deity in one’s heart and transferring the same into the image or symbol. Upacharas or modes of direct service. These upacharas can be 5 or 10 or 16. Sometimes they are raised to 64 or even 108. Normally, between 5 and 10 are common for daily worship and 16 for special worship. 64 and 108 upacharas are performed in temples on very special occasions. These upacharas are ceremonially offered with appropriate mantras to the deity invoked into the image or symbol. The ten upacharas are: 1. Padya, water for washing the feet; 2. Arghya, water for washing the hands; 3. Acamaniya, water for rinsing the mouth; 4. Snaniya , giving a bath by pouring water over the image or the symbol with Vedic mantras; 5. Gandha, applying fresh sandal paste; 6. Pushpa, offering of flowers, bilva and tulasi leaves; 7. Dhupa, lighting incense sticks and showing it to the deity; 8. Deepa, offering a lighted oil lamp; 9. Naivedya, food offering and drinking water; and 10. Punaracamaniya, giving water for rinsing the mouth at the end. The next step is pushpanjali or offering of a handful of flowers which is laid at the feet of the deity, indicating the conclusion of the whole ritual. Where the puja is done to the deity in a temporarily invoked image as in the worship of clay icons of Ganesha or Durga, udvasana or visarjana also has to be done. It is the ceremonial withdrawal of the deity from the image, back into one’s own heart, after which the image or the symbol, like a flower, can be disposed of. Note: The above method is as prescribed by Swami Harshananda of Ramakrishna Mission, Bangalore.